Magnesium and Noni juice work like a charm for me. Love your expertise Dr. Hays. 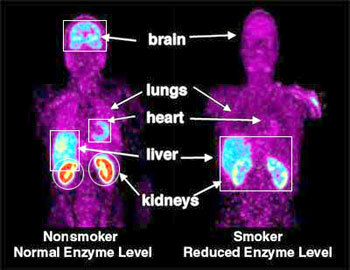 While there is a clear association between smoking and depression, the nature of that association is a bit complex. A review of 15 studies that followed adolescents from ages 13-19 found the relationship between smoking and depression is 'bi-directional'. Adolescents who developed depression seemed to be more likely to start smoking, and adolescents who smoke were more likely to develop depression (1). Stopping smoking for some people does seem to worsen depression, however most people will be less depressed, less anxious, and have a positive mood a few weeks after stopping (2). We also know that people who are in cognitive behavioral therapy (CBT) for depression who also use CBT for stopping smoking are more likely to stop smoking and have less depression. Another connections is that one anti-depressant medication, bupropion, is also effective in helping people stop smoking. I think the take home is that people have different associations between depression and smoking. Stopping smoking is probably most likely to help depression. But, if you are stopping smoking and find that depression is worsening, talk to your health care provider. There is help available. 1. Chaiton MO(1), Cohen JE, O'Loughlin J, Rehm J.A systematic review of longitudinal studies on the association between depression and smoking in adolescents. BMC Public Health. 2009 Sep 22;9:356.
in mental health after smoking cessation: systematic review and meta-analysis. BMJ. 2014 Feb 13;348:g1151. doi: 10.1136/bmj.g1151. Review. Erratum in: BMJ. With having Bipolar II Disorder one would think sleeping would be easier. For me to sleep at all requires drugs. Lots and lots of drugs.